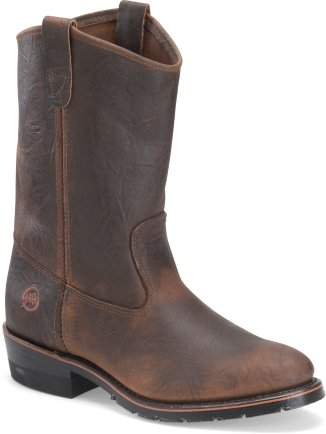 2522 Double-H. 11" Ranch Wellington. Looking for an Oiltan Work Western, see Double-H DH1552. 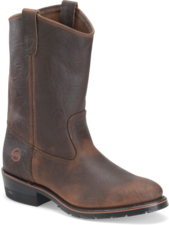 For over 50 years, Double-H Boots® has redefined extraordinary — crafting innovative work western and dress styles designed for todays new breed of cowboy — the hardworking men and women on the millions of farms, fields and ranches across America who demand performance and the best of durability, comfort and style. A lot of you may wonder, how can the world of Double-H be entertaining? Well, discover it here! Some of our own employees are involved in bands, such as Aerochix! We also support some great groups like The Doo-Wah Riders. Youll get an in-depth look at them performing, Q&As and more! Double-H Boots is proud to support Horses for Heroes, whose Cowboy Up! horsemanship and wellness program helps veterans and active military suffering from injury or combat-related stress to heal and reacclimate to everyday life and work through hands-on ranch experience in the company of other veterans. We commend this outstanding volunteer organization in their efforts to help those who serve our country.